I am seeing how art is helping Seniors in the Assisted Living and in Memory Care Facility here at Alma Via in Camarillo. I have also learned it is not the product that is important but the process of enjoying creations and expressing yourself. 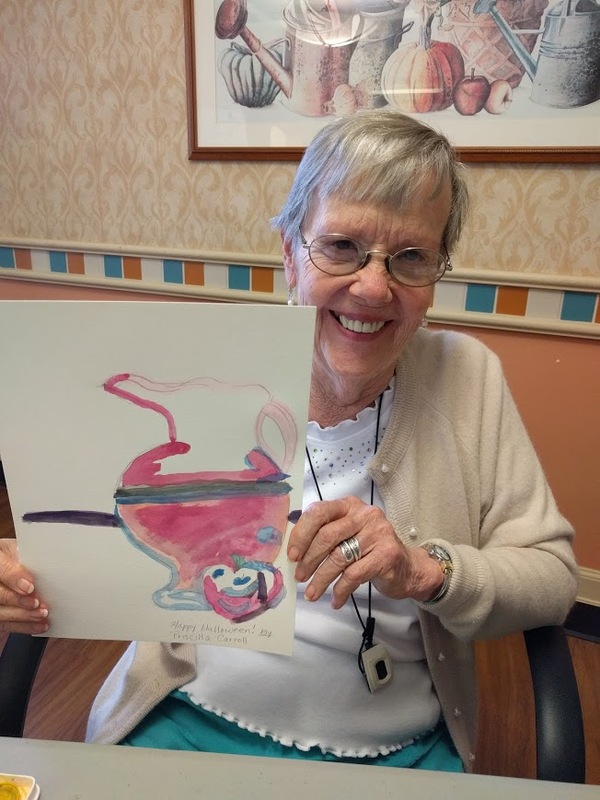 Many of the residents have limited dexterity, but enjoy creating pieces that are broken down simply. This helps them engage their minds and stay focused. They also enjoy the fellowship creating within a group and the dialogue and exchange of ideas, but don't we all learn and are inspired by others in a community. Some projects are just for the fun, and other times I like to work with my art therapy training to focus on a theme to help them process emotions. Especially as we are approach Thanksgiving, it is nice to have something that reminds us of the positive things in life. It is easy to slip into negativity when your mind is slipping, and the body isn't moving like it did at 40, but to focus on thankfulness brings health to our minds and bodies. We really have a lot to be Thankful for our friends, family, community, and needs met at a great facility like Alma Via Senior Living Home.